Ford Mustang VIN number 6F87CT85151 lived a rather average life. Born in early 1966, it toured the roads in style and power for years before it fell by the wayside after a minor accident. Left to sit in a field for far too long, what started as an easily repairable issue became unsalvageable as rust and decay set in. With a production run of over 600,000 in 1966 alone, it’s by no means a unique story. Still, when talking about such an icon, it’s always sad to see one fall through the cracks and become lost forever. Luckily for 6F87CT85151 and for the rest of us, the story didn’t end there. Dead as it was, the Mustang still had more to give, and thanks to its owner’s generous donation VIN number 6F87CT85151 sacrificed its body to bring us this- the REC P-51. The P-51, named for the Ford Mustang’s famous warbird namesake, is the fourth effort for Kickstarter-based Danish brand REC and the fullest extension of their unique mission- to create evocative, attractive timepieces out of reclaimed automotive materials. Mustang DNA is plentiful here, and as a design exercise there’s no denying it’s a striking achievement, full of clever elements and callbacks to the ’66 in three separate colorways. The five-piece case design of the P-51 is all about the details. From the front view, it’s a late 60’s rounded square case on steroids, evocative (intentionally I’m sure) of the Heuer Camaro, named for the Mustang’s Chevrolet rival. The size, however, is decidedly un-60’s, at 44X48mm with a 24mm lug width. Moving around to the side view, however, the idiosyncrasies of the P-51 really come into view. The multi-layer case, with its mixture of polished stainless and PVD surfaces jutting out from the matte PVD center case, seems almost reminiscent of modernist architecture for a moment, until six little impressions on the crown side bring it all into focus- this is the rear end of a ’66 Mustang, complete with fins, chrome bumper, and the iconic Mustang triple taillights. It’s a feature that could so easily come off as cartoonish or hokey, but the finish is so fine and the execution is just abstract enough that it all works. The side view also gives a much better view of the short, sharply downturned polished lugs, sticking just a few millimeters past the tall case sides. Around back, the multi-part construction comes into even clearer view, with six allen screws securing the caseback to the polished outer chassis and lug assembly. Engraved vertical lines and info text frame the narrow slice of sapphire display back, with a surprisingly unorthodox format. The 26-jewel Miyota 9130 movement sits well off center in the watch, filling only a portion of the display window, but what is visible is impressively decorated with Côtes de Genève, and a custom decorated rotor reminiscent of the optional hubcaps on the ’66 Mustang. For all the flair and finishing of the case, it’s obvious that the dial is the heart of the P-51’s design. It’s all down to that scratched and rusted steel top dial- the physical legacy of the 1966 Ford Mustang, identified by the dial-mounted VIN plate as 6F87CT85151. Each piece of sheet metal is unique, with its own markings and imperfections, so no two P-51s will ever be exactly alike. The way that light plays across that raw steel, going from harsh reflection to mottled grays, dappled with spots of rust and streaked with reflective scratches, is something that I catch myself staring at constantly. The contrast between that and the rhodium edges to the subdials, with their soft, even reflectiveness much like bead-blasted steel, adds even more dynamism. The subdials themselves continue to follow REC’s design philosophy of evocation rather than exact replication. There’s almost zero direct copying here, but everything immediately reads “Mustang”. The dashboard inspiration is obvious, with the main dial, date indicator, and power reserve subdial clearly riffing on a speedometer, odometer, and fuel gauge, respectively. 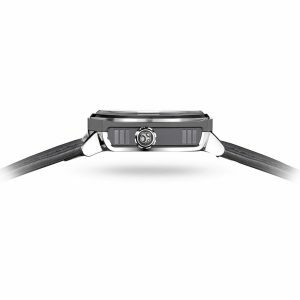 Both are recessed, giving the watch a ton of visual depth and deepening the gauge connection, but are not so deep that they can’t be read easily from an angle. The 40-hour power reserve is the less stylized of the two, with Mustang elements from the orange indicator-needle hand to the spacing of the markings, but with a few changes to suit its shift in purpose. 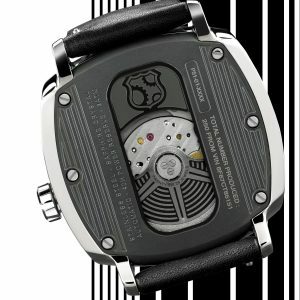 The “F/E” markings have been changed to “F/L” for full and low, and the subdial is labeled with a bold, and rather wordy, “POWER RESERVE”. This text takes up a lot of real estate on the dial, and in the interest of cleanliness it would have been nice to see simply “POWER” or even “FUEL” instead. The main dial is more of a blend of elements but manages to bring them together nicely. The orange needle minute hand, like the power reserve hand, is the closest thing to a direct Mustang copy here. The hour hand, however, is a skeletonized white triangle that feels almost like a 60’s radio dial needle, and the second hand is a simple orange-tipped gray stick. It’s a mix that shouldn’t work, but it’s instantly legible and communicates a lot of muscle-car feel in a small space. The dial itself is gloss black, with a deep groove inside the numerals helping both to emphasize the hour hand and drive home the gauge aesthetic. Around the edge of the dial is a slightly elevated minutes track with tall, thin numerals that would feel right at home on the speedo of a Mustang. At 6, however, is an inverted orange triangle pointing to the wide cutout date window. The whole assembly is small, only 20mm wide, but it’s still easily readable even at a glance. The pulsing powerplant of the P-51is the automatic Miyota 9130. Miyota is an almost ubiquitous choice for microbrands nowadays, with the increasing scarcity of ETA customer movements, but somehow this is one of the first outings for the 9130. That’s more of a commentary on the rarity of power reserve complications than it is on the quality of this movement, however, as the 26-jewel 9130 is both competent and attractive. Beating at an impressive 28,800 vph, the 9130 provides a very smooth second hand sweep, adding to the speedometer feel of the dial as well as ensuring dead-on accuracy. The power reserve itself, at 40 hours, is more than adequate for the owner who likes to rotate through a few different pieces, and the addition of the complication makes managing that rotation an at-a-glance decision. The decoration here, as seen through the narrow-slice display back, is attractive if unspectacular with uniform Côtes de Genève across the plates and a custom-embossed rotor evoking the optional hubcaps on the 1966 Mustang. Overall, it’s a solid choice by REC, but for a watch that retails for $1495, they’re pushing the uppermost limit of price for a Miyota. The REC P-51-01 comes on a 24mm black genuine leather strap. 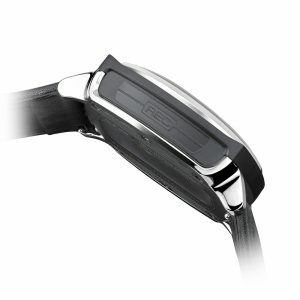 It’s thick, supple, and has a brilliant signed PVD buckle, but this is a watch that could benefit from experimentation. Olive leather, a sturdy mesh, or especially a big-hole rally strap would all look at home here. It’s definitely more of a casual watch, both in size and design, and works perfectly with a slightly vintage wardrobe. Think white tees, Vans, and denim jackets- classic American masculinity is the P-51’s forte. From the minute REC announced the P-51, they had some incredibly big shoes to fill. The first-generation Ford Mustang is an undeniable American icon, and it would be easy to miss when taking aim at such a lofty target. 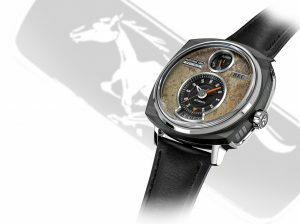 So many automotive-themed timepieces come off as either disingenuous or clumsy, either a cynical pandering to a vibrant subculture or something that fails to understand what makes either cars or watches attractive and interesting. The team at REC are neither. There’s a genuine passion that shines through in the P-51, a love for the automobile every bit as deep as their love for horology. It’s not a perfect watch by any means. It’s a little too big, there are a few odd choices here and there, but it’s just so damn enthusiastic you can’t help but love it. At the end of the day, though, REC hasn’t made a watch for everyone with the P-51. They’ve made something that, for some of us at least, has no substitute.